It’s only when picking up the car – a grotesquely large, shiny white Dodge Challenger – at Albuquerque’s airport that we fully appreciate how barren New Mexico is. From the unglamorous vantage point of the Alamo car rental office, what seems like most of the scorched, brown state spreads out for miles in front of us, like a thin layer of Marmite. The only break in the land is the clutch of skyscrapers downtown, which marks the start of our journey on Route 66. 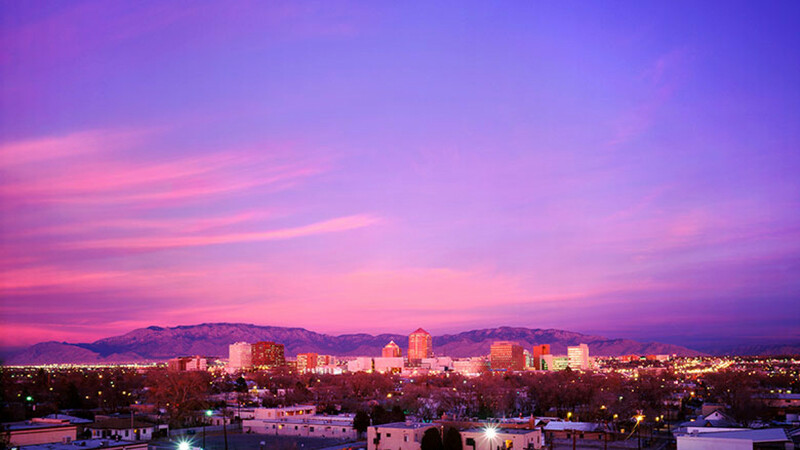 If your only Albuquerque frame of reference comes from Breaking Bad, it’s a good place to start. The cornflower blue skies, ironing board-flat parking lots and uniformly beige high rises where illegal narcotics are made and sold on the silver screen look bigger, bluer and more bleak in real life. 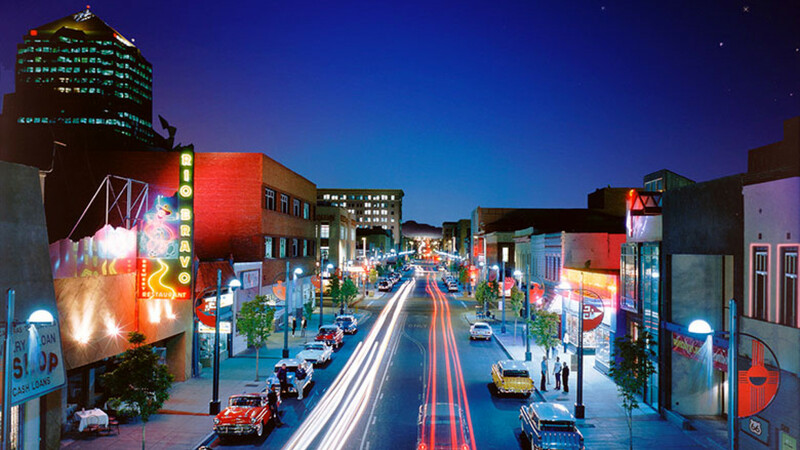 It’s desolate and dusty, and Central Avenue – downtown Albuquerque’s section of the Mother Road – is a seven-block-long dive bar crawl, full of neon-fronted bars from which locals erupt on a Saturday night. (Tip: head to Andaluz Hotel on the corner of Second Street and Copper Avenue for dinner at its hip tapas restaurant MÁS.) New Mexico is historic Navajo territory, and Native American heritage is still alive in the quaint Old Town, which is awash with touristy stalls selling jewellery (and burritos). If you don’t fancy a coarse poncho or feather earrings, grab a slice of old-school Albuquerque from the Golden Crown Panaderia, which sells Mexican bolillos and empanadas laced with green chilli. Life drains away when you leave the city proper, and the yawningly empty Route 66 cuts through red cliffs on either side. 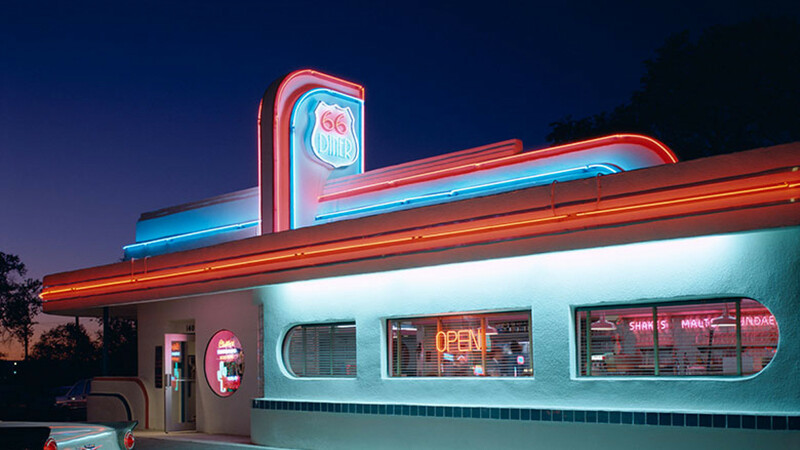 This part of the Mother Road makes for the archetypal road trip postcard – deserted roads, spectacular scenery, motels and drive-in diners serving brain-freeze milkshakes. Crossing the Rio Grande river, surrounded by lush farmland, we trace Route 66 through empty desertscapes and old Indian reservations towards Gallup, the last town before the road breaks into Arizona. Our first stop is the barren To’hajiilee, a Navajo reservation just off Interstate 40 and the scene of a particularly brutal episode of Breaking Bad. The minute we kill the Challenger’s engine, the tinny beat of Ginuwine’s Pony stops and we’re standing high up on a dusty orange cliff in total silence. All that’s around is the occasional road sign pointing down a track to ramshackle camps or makeshift houses. Further along the interstate is Acoma Pueblo, a hilltop reservation that’s said to be America’s oldest settlement. Sky City is the first thing you’ll see from Route 66, atop the table-shaped sandstone mesa. From the top, it provides a jaw-dropping view of the road into the distance. Still within New Mexico’s rocky orange clutches, following freight trains chugging from Chicago to LA, we stop for lunch in Gallup, where a third of the population has Native American roots. It’s not a pretty town – streets are slathered in neon signage, some working, some not. The only place open is Jerry’s Cafe, serving burritos and tacos, coated in thick chilli-cheese sauce, with an obligatory splodge of Mexican black beans. 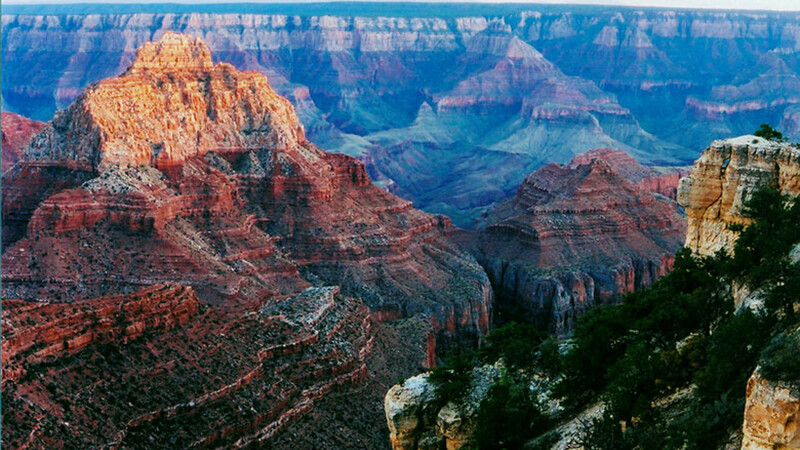 The dramatic scenery we got used to doesn’t immediately change over the Arizona border, and the viscerally named Petrified Forest National Park and Painted Desert (entry fee $10) are a nice warm up for the Grand Canyon just 300 miles west. The Petrified Forest isn’t a forest at all, more a landscape of burnt stumps of wood, while the Painted Desert is easier on the eye, and is a flatter version of the Grand Canyon. Rolling into Flagstaff, the landscape changes dramatically, from expanses of brown with sparse terracotta rocks to swathes of tall fir trees. The temperature drops dramatically: there’s snow on the mountains, and shorts and sandals suddenly aren’t suitable when I wrench myself from the Challenger to find it’s 12ºC outside. 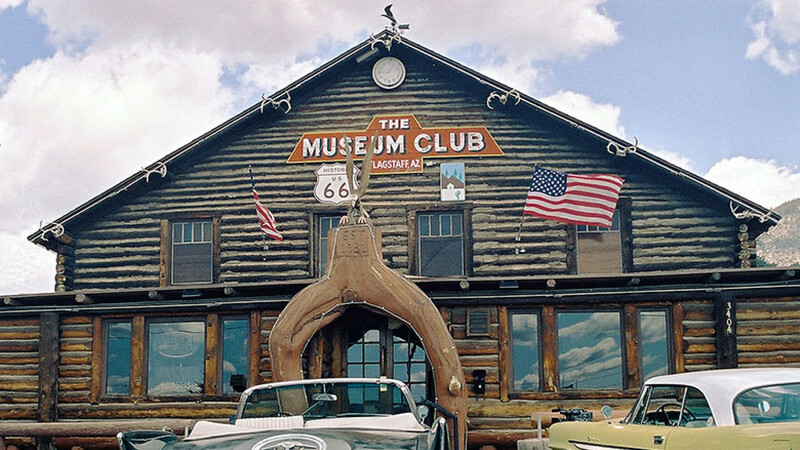 Mountain town Flagstaff is vintage Route 66 at its best. 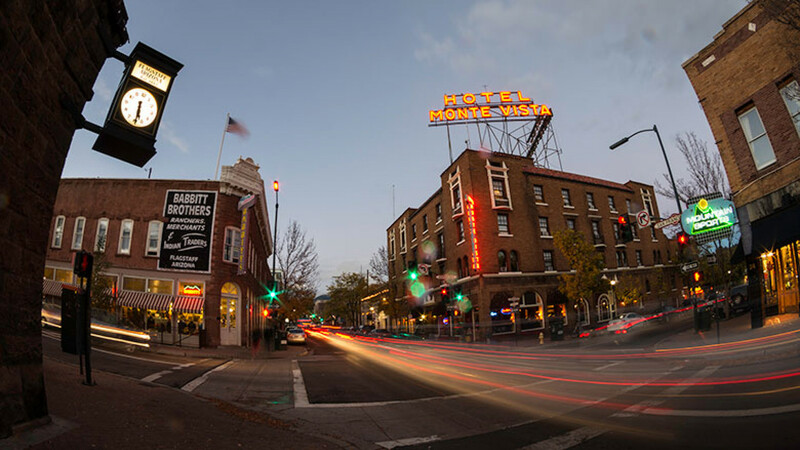 At night, the network of streets around downtown light up with neon signs promoting hotels, theatres and clubs, and the Museum Club, a ski chalet-esque wooden bar that puts on live music most nights for beleaguered drivers, is reminiscent of its past as a stopover town. It’s got a burgeoning craft beer scene, too – Beaver Street Brewery does a storming menu of home-grown beers (try the raspberry-flavoured Bramble Berry Brew) and pizzas out of its wood-fired oven. We’ve been smugly informed by locals that the South Rim of the Grand Canyon is by far its best side, and it’s just a three-hour trip on the endearing Grand Canyon Railway (in the luxury parlour car, no less) from former mining town Williams. (It’s not strictly on Route 66, but when in Arizona, right?) Whether or not you choose to blindfold yourself before you get to the lip of the ravine – great advice that, given it’s a 1,800m drop to the Colorado River below – there’s little that can prepare you for the vastness of it. From the South Rim, there are various hiking trails both around and down into the canyon. The last section of Arizona’s Route 66 rolls through some of its most stereotypical places: deserted Seligman, which is little more than a handful of gas stations and motels strung together on the roadside, and Kingman, the last proper town before California, where we stop for an artery-exploding lunch of hot dogs, milkshakes and Elvis memorabilia at Mr D’z Route 66 Diner. My waistline has expanded after four days of tipping processed meat and cheese through my maw – but with fascinating Navajo culture and some of the best scenery in the world to discover, who’s counting?